Major US yacht builder Hunter Marine build vessels that are strikingly different to the production norm. The Hunter 356 encapsulates the company's latest thinking on moderate displacement design. Steve Raea reports. Standing alongside the Hunter 356 at Auckland's Westhaven Marina, it is not hard to tell that this is an imported production yacht. The high topsides, sweeping bimini covers, acres of stainless steel and unusual rig configuration all screams out "foreign". Hunter yachts are not new in New Zealand waters having been imported in small numbers in the 1990s. It would be fair to say, however, that buyers weren't queuing up to buy them. Kiwi yachties then, and to a lesser degree today, were suspicious of imported yachts, citing - often without foundation - poor build quality and even worse on-the-water performance. What buyers did like about Hunter - and other imported brands - was the boats internal volume which usually provided a minimum of two separate cabins, hot shower, shore power and a host of other cruising amenities, traditionally the domain of much larger and more expensive yachts. It transpired therefore that buyers were predominantly weekend cruisers with no real interest in performance. It is exactly this type of buyer that Hunter Marine is targeting with the new 356 and makes no apology for that. 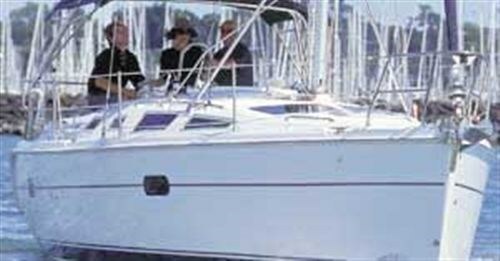 What Hunter Marine does well is produce roomy weekend get-away cruisers with a clearly defined accent on comfort. That said, Hunter's development in recent years has increased the performance factor through lighter yet stronger construction methods and performance orientated keel and rig configurations. It has done this without sacrificing internal volume or cruising amenities. Hunter Marine has been producing yachts for three decades and is now one of North America's largest yacht builders with a fleet ranging from small club trainers to the ocean-going Hunter HC 50. It is worth noting that America's Cruising World Magazine voted the Hunter 356 the best new cruising yacht in its class (under $US200K). The Hunter 356 is manufactured in fibreglass sandwich construction with a balsa core and a Kevlar laminate that runs from the stem to the keel sump for added impact resistance. The hull and deck is bonded together with glue and thru-bolted with additional layers of epoxy around the chainplates. A high-density vinyl rub rail with stainless steel insert is then wrapped around the entire topsides Hunter Marine manufacture their own composite rudder post, preferring the strength and stiffness over stainless steel. The keel is antimonious lead and is available in both deep draft (1.96m) and shoal draft (1.52m). The keel is attached to the keel stub with stainless steel keel bolts. A distinctive feature of the Hunter range of cruising yachts is the B&R rig named after its designers Bergstrom and Richter. The rig employs a smaller than normal deck-stepped alloy section, pre-bent with twin diamond stays before being stepped. The mast has twin swept-back spreaders angled at 30 degrees and has a single set of lowers and caps with twin fixed-strut supports low down. The rig has a particularly wide shroud base and this has allowed Hunter to dispense with a backstay. The payoff here is the ability to carry a big-roach mainsail and a smaller 110% Genoa, providing easy sail handling and less rig loading. The down side is that the spreader angle does not allow the main to be eased beyond the spreader angle, making it difficult to run square off of the wind. But, as the polar diagram in the Hunter manual shows, broad reaching is a faster and more comfortable down wind option. Selden, one of the world's largest builders of kitset masts, manufactures the Hunter spars. The rig set up includes single-line reefing with halyards led aft to Lewmar winches positioned each side of the companionway. Options include a solid vang and in-mast furling. Another Hunter trademark is the aft Targa arch over the cockpit. The arch carries the mainsheet traveller and optional bimini covers. It is an unusual arrangement and one that will take Kiwi sailors some time to get used to. But it works well, the only real downside being that it is difficult to see the position of the car on the traveller without standing on the cockpit coaming and looking over the top. Again, there is a windage element here that might not suit the purist. For cruisers, however, it's a gem, keeping the cockpit clear of rope clutter and the shin-shattering traveller. Hunter originally manufactured the Targa arch in GRP but has chosen large-radius stainless steel for the 356. This is firmly thru-bolted to the deck and provides excellent handrails when moving around the cockpit. 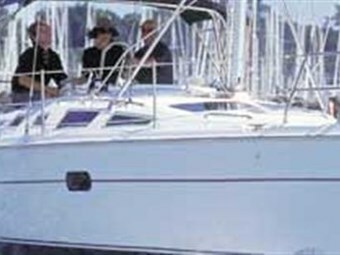 The bimini cover is full-length which means sailors used to relying on a masthead Windex when sailing close-hauled will find the bimini cover frustrating. Hunter has added a small clear plastic panel in the canvas to view the masthead but I found you have to be in just the right position. Wind instruments will therefore be a must for the performance-orientated sailor. The Hunter 356 cockpit is principally designed for socialising and features the hallmark Hunter-look with high, rounded combings and wide seats delivered complete with cockpit squabs. The transom seat folds back to double as a boarding step, providing walk-through access to the swim platform. 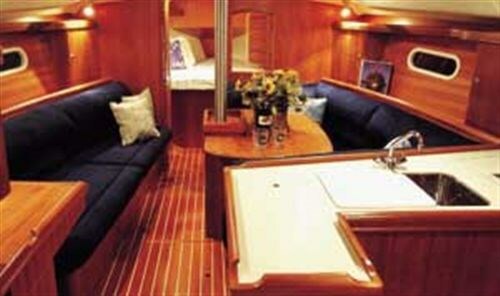 The transom has two large storage lockers each side of the walk through, one fitted with a hot and cold cockpit shower. A telescoping boarding ladder slips in under the cockpit sole. The 356 helm station is set well back in the cockpit and revolves around a Whitlock moulded wheel console housing the standard Raymarine instrument package, Danforth compass, drink holders and single-lever Yanmar engine control. A bi-fold cockpit table is set forward of the console and hinges up to provide a stable platform for happy hour drinks. The helm position is comfortable and well thought out but the compass placement is too close to the helmsman and is difficult to read. Cockpit storage is excellent with a giant locker on the port side that is large enough for an outboard, roll-up tender, rods and other summer essentials. It even has holders for the companionway hatch boards. The starboard side cockpit seat also hinges back to allow fresh air to flow into an opening Lewmar hatch that services the double berth below the cockpit. Life below decks on 356 is very comfortable indeed. The immediate impression is one of volume, due in no small part to the large amount of natural light that filters into the boat through what Hunter describes as the windshield; two large windows set into the coach house roof. These are supplemented with good-sized windows in the cabin and smaller windows set into the topsides. The U-shaped galley is set immediately to starboard of the companionway and features Corian bench tops, twin-stainless steel sinks, hot and cold mixer, Force 10 LPG stove and microwave. Refrigeration is excellent with a 285-litre Waeco fridge and freezer unit, each compartment with a gas strut to keep the lid open while fossicking around for the evening meal. There is ample storage with cupboards and drawers and the boats are delivered with dishware. Immediately opposite the galley is the head and shower unit set in an L-shape. The head and shower share a moulded cubicle with a teak floor grill and large hanging locker and shelves for wet weather gear. The shower has separate hot and cold taps and a manual Jabsco toilet plumbed through to a 110-litre holding tank. A moulded Corian vanity top with hot and cold water and a large mirror occupies the remainder of the bathroom. The whole head area is nicely moulded with easy-clean liners and good storage. The saloon features a U-shaped settee to starboard with a large teak table that drops down to form a double and through which the mast compression post disappears. A three-seater settee is set to port opposite, giving a seating plan that will accommodate eight at a squeeze for dinner. The port settee doubles as a seat for the aft-facing nav station which has a lift-up lid for chart storage. The boat's circuit breakers and switch panels are set in against the hull with a console for HF and VHF radios and navigation instruments. All interior joinery is in solid teak or veneers which, combined with the high-gloss teak and holly floor, gives the boat a warm honey glow. Moulded roof linings - padded in places - ensure a very good standard of finish. It should not be forgotten that the 356 is a production boat with a kitset fit out and, as such, buyers won't find teak plugs in the joinery or hand-made radius corners, but that said the overall standard is high. The 356 has two double cabins, a vee-berth in the bow and a transverse double set in under the cockpit and accessed through the galley. The forward cabin has a hanging locker to port and drawers to starboard and under the berth. There is a large overhead hatch for ventilation and light, and an opening timber window set into the main bulkhead to help open up the boat. There is generous standing headroom in the cabin and plenty of room to get dressed with the cabin door closed. The master cabin is aft and features a large transverse double set in under the cockpit. There is ample room to stand up with the door closed and good sitting headroom once in bed. A nice touch is the upholstered headboard and twin bedside cabinets. There is good storage with lockers each side of the bed and a large hanging locker just inside the cabin. The boat's tanks are located under the bed. The transverse double is a feature of Hunter design and works very well with an overhead hatch for light and ventilation and a moulded ceiling liner. With a dry displacement of just under 6400kg, the Hunter 356 is no lightweight and as such tends to be a bit sticky in the light, particularly with its modest sail plan. We sailed the boat four-up in very light airs of eight to 12 knots in flat water off Auckland's North Head. While performance wasn't sparkling, it wasn't that bad either, maintaining four to five knots in the fluky conditions. The boat responded well to the puffs and accelerated quickly, suggesting an easily driven hull. The wheel steering was impressive with the boat turning on its axis under motor. The sail plan is easily managed and the mainsheet, traveller and Genoa sheets are all within easy access of the helm. The outboard boom angle is a lot more pronounced than most keelers and is more closely aligned to a multi-hull than a mono. This is because the boom has to clear the Targa arch. The 356 are delivered with a factory-fitted 27HP three-cylinder fresh water-cooled Yanmar diesel swinging a two-blade fixed prop on a one-inch shaft. The engine is well insulated and mounted and pushed the boat along at 6.5 knots at 3400rpm. All up, the 356 achieves its primary purpose very well - a roomy weekend cruiser with an emphasis on comfort and easy handling. The overall standard of finish is impressive and the standard inclusions generous. My only real complaint is the inability to run square off or view the mainsheet traveller and masthead from under the bimini. The best thing about the 356 is the price. A standard sail-away package starts from $298,302 and rises to $318,759 for the boat as tested.